Fenwick of Bond Street commissioned Pierre Le Tan, the pre-eminent French illustrator to tell the story of the Royal Academy of Arts 250th Anniversary for their window displays. As part of his first major commission in London for over two decades, Pierre wanted to chart the history of the RA, including seminal figures such as George III, Joshua Reynolds and Gainsborough. The artist also included famous artworks shown at the RA and Burlington House. 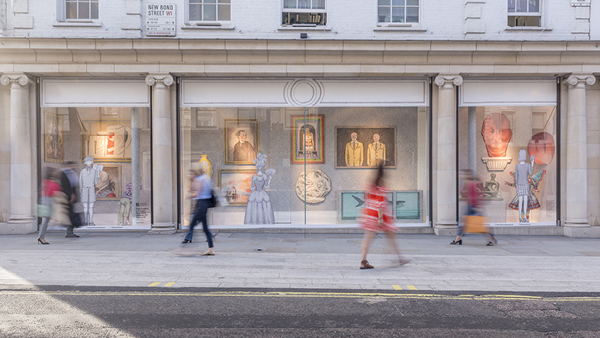 Fenwick asked us to help bring Pierre Le Tan’s work to life in their primary Bond Street Windows and provide ideas on how to create an illustrated version of the interior of the Royal Academy. A blend of 2D and 3D visuals were produced using Pierre’s original illustrations and 3D arches were designed and built connecting the windows together to emulate a gallery. In collaboration with Fenwick and Pierre himself, our team delivered a uniquely stunning & fitting tribute to the Royal Academy’s 250th birthday celebrations!